Snoe is a local brand that has been around for almost 3 years. They're most famous for their 12 varieties of whitening soap bars, the popular Hair Heroes hair care line, and of course their cute and creative packaging. 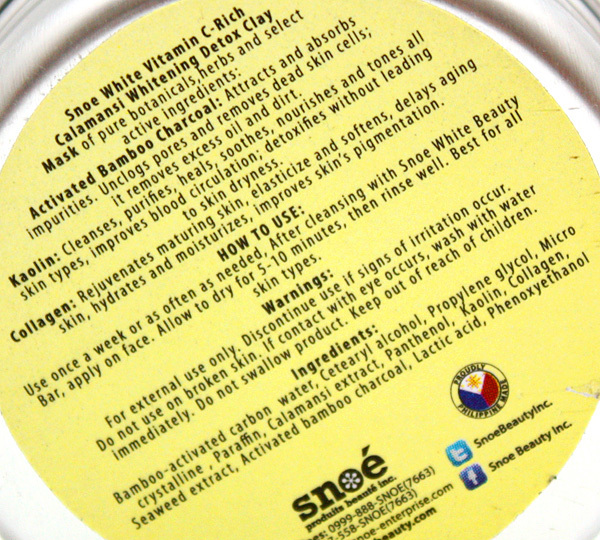 I stopped by a Snoe kiosk to ask about their sun protection products but walked away with the Snoe White Vitamin C-Rich Calamansi Whitening Detox Clay Mask. 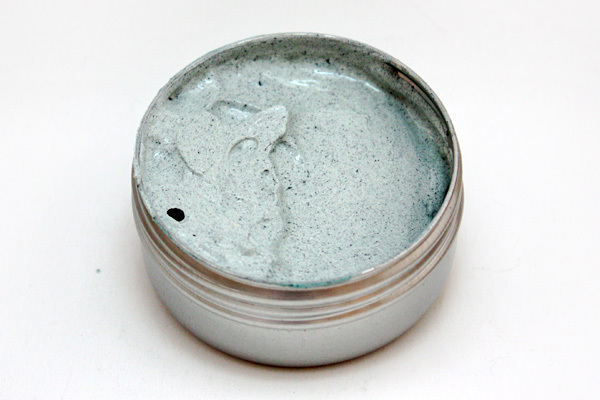 I was attracted to the clay part of the label, because kaolin clay is badass at sucking out oilies and comedones. This mask is to be washed off after 5-10 minutes, and used once a week or as often as needed (thrice weeky in my case). After rinsing, skin feels lifted, tight but not dry. It feels like the mask preps my skin for moisturizing. Within 2 uses my face was noticably softer and more even-toned. Pimples threatening to burst to the surface were averted. And the blackheads on my nose had melted away! I was hooked. I can't say much about the whitening properties because I wasn't after them. (My face is paler than the rest of my body!) My skin did appear brighter immediately after using the mask, but the effect was temporary and probably due to capillary vasoconstriction. I tend to use it more just before my menses, when my hormone levels are elevated, and this helps calm my skin. Of course, I always moisturize after washing off the mask. A word about the scent: lately I'm more sensitive to smells, and the sharp smell of the charcoal and clay gives me a headache and nausea. You'll notice that I've avoided the area around my nostrils. This minimizes the effects of the scent. Don't let the small size of the tin fool you. A little goes a long way. It's taking me forever to finish this tin. Two months and it's still half full. 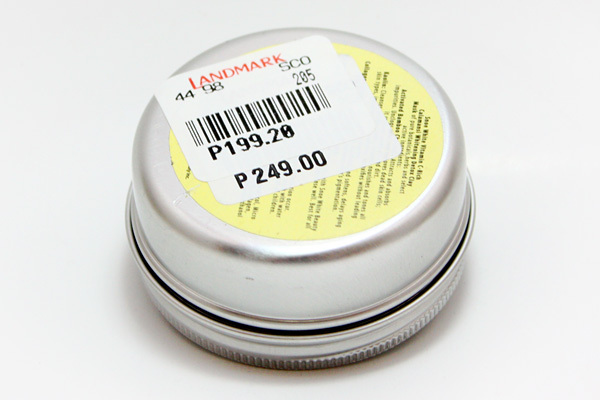 There was an Cosmetics Fair at Landmark Trinoma that month so I got this at 20% off. But even without the discount, this mask is value for money! 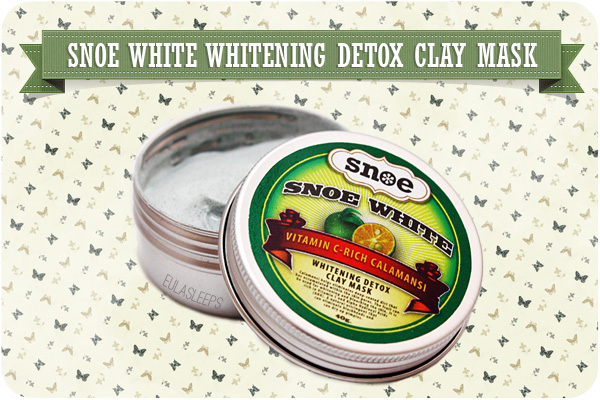 The Snoe White Vitamin C-Rich Calamansi Whitening Detox Clay Mask is available at all Snoe kiosks and boutiques for Php 249. This was my first Snoe purchase, and after feeling the results I wanted to try more of their products. With all that's happened this holiday, I didn't get around to buying any. But as luck would have it, Liz of Project Vanity chose me as her "November/December Commenter of the Month" -- and the prize was a generous loot of handpicked Snoe goodies! Liz was so sweet and even made time for us to chat. 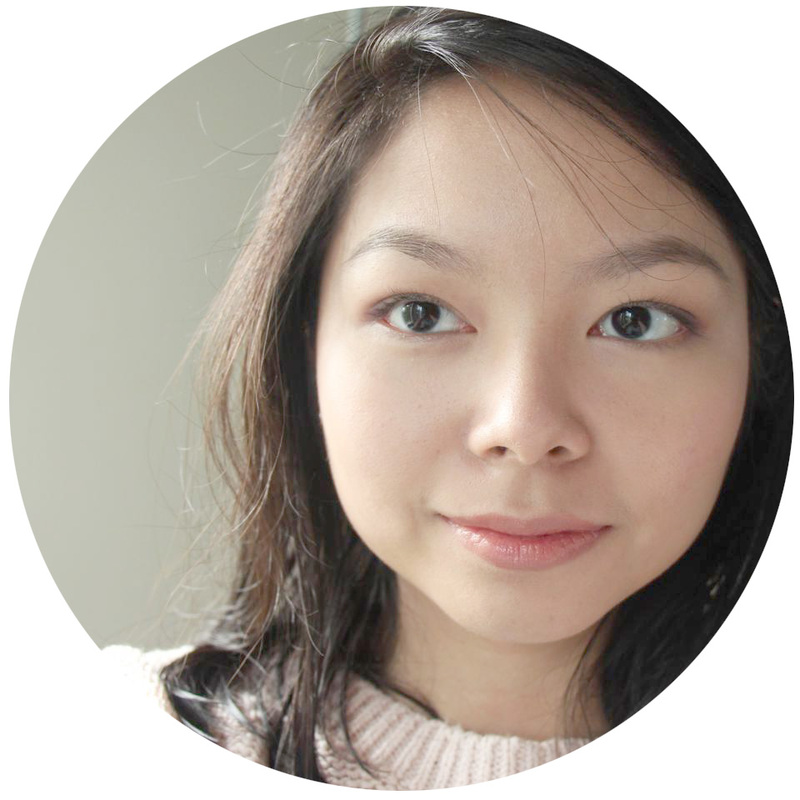 About beauty of course, but also blogging and life in general. Don't pay attention to the haters; Liz is super nice and very pretty in person. 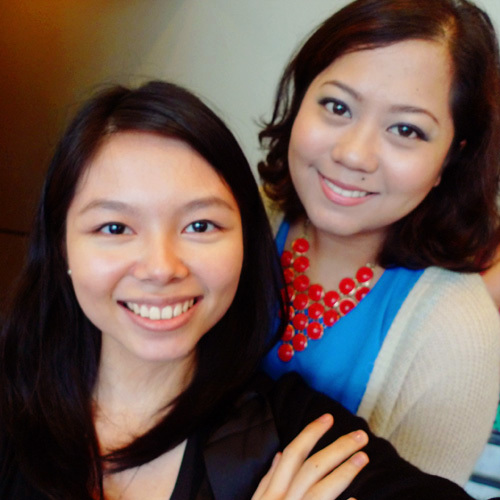 Meeting with her cheered me up a lot. It's like Christmas past Christmas! I'm excited to try everything but I'm trying to be smart and introduce skin products one at a time. I've been using Hair Heroes Extreme almost daily. I love how smooth and fine it makes my hair. The Rouge Deluxe lipsticks are quite pigmented as well. Thank you Liz and Snoe Beauty! What Snoe products have you guys tried?